Jamplay’s online guitar lesson membership has been one of the industry leaders for close to a decade. While there are many excellent features, a Jamplay membership is not for everyone. As not only a guitar teacher, but a long time Jamplay member, I want to help you decide if a membership is worth your money with this Jamplay review. Guitar lessons can be found very easily online. With how easy it is to create & upload to the web today, online guitar lessons are a dime a dozen. Hundreds, if not thousands are offered free on sites like YouTube and Vimeo. 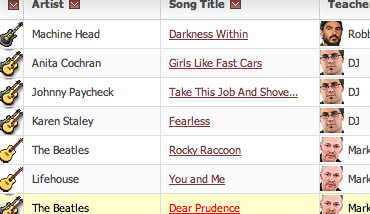 As well as millions of guitar TABs offered in databases, putting all your favorite songs at your finger tips. However learning this way leaves a huge gap in the learning process. You’re getting the TABs and maybe a video lesson, but missing all of the knowledge that went into making that music. Being a guitar player is about more than just knowing how to play 100 different songs. You need to be able to dissect and write them too! Jamplay.com offers an excellent solution to bridging this gap at an affordable cost. Over 70 Instructors to Pick from- Find Your Match Today! Check Out All the Awesome Features Jamplay Offers: Here. Unfortunately Jamplay does not offer any free trials. However they do have a 7 day money back Guarantee. So if you decide within a week that you don’t like the service, you can get a full refund of what you paid. Also, you can get 25% off your first month at Jamplay: Here. If I'm Dissatisfied, Can I Get a Refund? Absolutely! Jamplay has a 7 Day Money Back Guarantee. If after a week you decide that Jamplay isn’t for you, simply cancel your account, shoot them an eMail explaining that you’re unhappy with the service and you’ll get a full refund. Is There A Helpful Community? Yes, Jamplay features a massive online community of both guitar teachers and students. Is There A Limit On How Many Lessons I Can Take? No way! With a full membership you have unlimited access to all 4,000+ guitar lessons, 100s of song lessons, dozens of features, games and more! As a thank you for reading my review I have a discount code I would like you to have. Follow this link to get 25% off your first month at Jamplay.com: Let’s Do It! Interested in getting 25% off your first month at Jamplay? Click Here! JamPlay has a wide variety of features for their members. From lick and scale libraries to fret and note memorization games, there are enough features on Jamplay to take you from a complete beginner to an expert guitarist. See the full list of Jamplay features here. 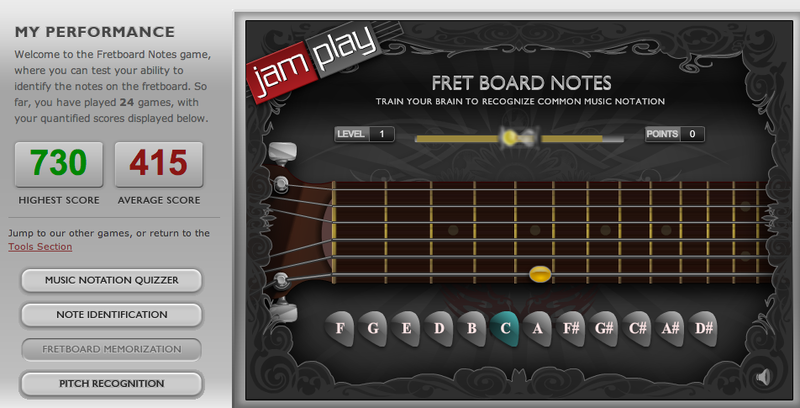 My favorite features, and the 2 I still use the most often, are the fretboard and note recognition games. I learned the fretboard a long time ago. However, it is always good to practice to keep everything fresh. The game offers multiple difficulty levels and allows you to choose a span of frets to quiz yourself on. Founded in 2006, Jamplay has made a name for itself as the premier online guitar lesson website. Offering over 4,000 guitar lessons, with over 70 professional guitar teachers, including many from famous bands, it’s easy to see why Jamplay has earned such an excellent reputation in the short time it has been around. In Phase 1 you will learn all the essentials a beginning guitar player should know. A strong emphasis is put on learning and applying theory from the very start. Lesson topics include everything from holding a pic to advanced harmonic minor soloing. In essence, these lessons are not only designed for beginners, but to take you from a beginner to an intermediate guitarist. Lessons are offered both on guitar and bass, as well as electric and acoustic guitar. These lessons are also offered electric and acoustic, guitar and bass. After completing a fair amount of Phase 1 lessons, you will want to start developing your strengths and improving your weaknesses. To do this you will need more focused lessons. You’ll need lessons devoted to only to 1 or 2 concepts. This is where the skills lessons come in to play. Everything from tapping to sweeping to singing while playing guitar. Name a guitar skill, that’s your place. Like a few bands in a certain genre and thought about starting your own? Not really sure what the common scales, chords and riffs in that particular genre are? That’s where the genre lessons will help you out big. From Classical to Reggae to Flamenco- it’s all in there. This is what every beginning and intermediate guitarists wants. In a survey of 1000 guitarists who had played for 1-3 years, over 90% reported learning songs as their #1 goal. Next in the 4 Phase System is Jamplay’s extensive list of song lessons. These lessons are sortable so you can filter through the lessons you want to take. Lesson filters include: difficulty, acoustic vs electric, genre, lesson duration and more. These lessons may be Phase 3, but you can access any of them at any time. Once you’ve learned your fair share of songs, you’ll want to start creating original music. When that happens learning the ins and outs of songwriting is a must. There is a science to song structure that formulates to awesome songs. These lessons will teach you that formula to get you writing songs in your favorite genre, and fast. The most obvious drawback Jamplay has is it’s cost. After all, of all the online options, Jamplay is the most expensive at $19.99/mo. Their money back guarantee is also only for 7 days. That doesn’t leave the user much time to try out the service and decide if the website is right for them. Additionally, unlike GuitarTricks, Jamplay does not offer any sort of free trial. I think with such a short money back window, a trial of some kind would be nice (Tip: That link brings you to a FREE GuitarTricks trial). One thing I really like about Jamplay is the “Progress Report” feature. This feature tracks the progress you make in every Jamplay lesson you ever open. By accessing your progress report you can not only see a history of every lesson you have ever taken at Jamplay, but also how far you got in each lesson and a combined completion percentage of every lesson. This feature is a great way to note if you are jumping from topic to topic to frequently. Guitar takes time, as does the mastery of any given concept on guitar. Keep your percentages above 80% and you’re doing well. I don't have any questions but did want to pass along that I'm very impressed with JamPlay and Steve Eulberg in particular. It's not often anymore that the you purchase something and then find that it actually exceeds your expectations. So I'm very pleased so far. WOW guys I just wanted to say great job on the site. I used to play guitar a lot but just somehow managed to lose interest & could no longer find time to play. I can now just pick up my guitar whenever I am in the mood and start learning. I have never been so excited about learning! I've got to tell you that this is the best experience that I could ever have. I have taken guitar lessons from a local teacher who is superb. Unfortunately I had to stop for a while and couldn't get back with her to continue. I find your instructors, especially Steve Eulberg outstanding. When I had question, the answer always came back to me within 24 hours. I want to thank you again for your professional service and excellent instruction. Get 25% Off Jamplay Lessons! Compared to the rest of the competition, Jamplay by far has the most lessons and features. In addition to featuring some of my favorite learning tools, like the fretboard memorization game, most of their lessons also put a heavy focus on theory and application. You will be paying $5-$10/month more by going with Jamplay, but the membership features alone speak for themselves. I hope you found this review of Jamplay guitar lessons helpful. Should you have any questions or comments, please leave them for me in the box below. I will get back to you within 24 hours, usually much sooner. Thanks for reading and good luck! Thanks for this review! You very clearly explained exactly what Jamplay is and what they offer. I really liked the layout of the review – it made it so much easier to really digest all the details. Thanks! Hey James, thank you for the comment! I’m happy to hear you found the review helpful. Good luck with your choice, pal! Hi, thank you for the kind words! I’m glad you found the review helpful. Hi Margaret, thank you very much for the kind words. I really appreciate the comment, and you’re welcome! Hey Christopher, thanks for the great feedback. I’m glad you enjoyed the samples! Plenty more lessons, with TABs and more, over at the Jamplay website. Hi Llana, thank you for the kind words. I really appreciate your comment! I’m glad you found the review helpful. I suspect they secure the sale by drawing you in with a free trial or, in this case, a 7 day money back guarantee, but don’t give you nearly enough time to really try things out. That said, if they can offer value for money, then I guess you could overlook something like this. Actually Ken, in just an afternoon I was able to decide that Jamplay was the best choice for me. I certainly agree 7 days is not very much time at all, and most people will take a bit longer to decide than I did. However, you can definitely tell by lookin around if you will be able to find what you need. You can also cancel at any time, so if you cancel before the next billing period, you will not be billed again. Jamplay is definitely one of the best online guitar lesson sites out there! Thanks for the comment Charlie, I’m glad you found my review helpful. Should you end up going with Jamplay, please drop by again and let us know what you think! Anyway, I`m thinking of going to Jamplay rather Guitar Tricks, it just seems better value.Overall, thanks a lot for the very in-depth review mate!